BT-44 is a Project 12650 coastal minesweeper. The ship was commissioned in 1985. 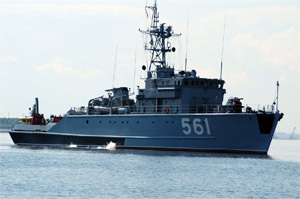 The ship used to serve at Northern Fleet. In November 1993, the ship was deactivated, and in 1995 decommissioned due to wearing out and lack of funds for interim overhaul, and was subject to dismantling.